Ijad Madisch started ResearchGate in 2008 to change the scientific method, and depending on where you sit, that either is or isn’t as ambitious as it sounds. Madisch isn’t on a crusade to overturn the techniques scientists use to investigate and systematically observe phenomena, so much as the tools. Today, there’s an incredible amount of scientific research taking place, whether it’s in chemistry, physics, biology or any of the umpteen disciplines in between. However, typically, scientists, especially those who work in or around academia, live mostly in an offline world. Today, as a result, one of the biggest problems to plague scientific research, innovation and breakthroughs is redundancy. A team of scientists hard at work on protein data analysis publish their results only to learn that a group on the opposite side of the world has just done the same. As both a physician and a researcher, Madisch decided that the best way to reduce research redundancy would be to create an online professional network in which scientists could easily share data, information and results. Research would become more effective, and science would be better for it. Monetizing a professional network of scientists (something that could potentially be tricky) has proved far easier than changing the stolid mindset of scientists and academia, the founder and CEO tells me. Bringing entire communities and communication methods online is a slow process, whether dealing with microbiology researchers or not, and luckily for Madisch, ResearchGate hasn’t been short-changed when it comes to investors willing to its vision of the future. And that backing got significantly deeper. Today, ResearchGate announced that it has closed a $35 million round of series C financing from Microsoft founder Bill Gates and Tenaya Capital, with participation from Dragoneer Investment Group and Thrive Capital. This hefty third-round of financing follows its series A and B rounds raised in 2010 and 2012, respectively, which saw it add names like Accel Partners, Simon Levene, Bebo co-founder Michael Birch, Founders Fund, Benchmark Capital, and Yammer CEO David Sacks as investors. Cohler recognizes a similar ambition at ResearchGate to what he saw in his early days at LinkedIn and Facebook, and that, like those two businesses, the startup could be on its way to becoming a “true network effect business.” Granted, ResearchGate isn’t quite on the same growth curve as the two early social networks, but it’s begun to find some traction in the scientific community, having grown to more than 2.8 million members spread across 131 countries since launch, with 30 percent now logging in once per month. Since we last caught up with ResearchGate, the startup has been hard at work at making it easier for scientists to get out of their silos, where they often study niche and very particular problems and look for collaborators with very specific skill sets. By creating a network in which scientists in any discipline can create a simple profile that displays information that will be relevant to scientists in their field, including degrees, areas of focus, keywords, advisors, publications and so on, the team hopes it is helping to solve a long-standing problem in the space: That there are so few public resources to which scientists can turn to quickly discover those research in similar fields. What’s more, ResearchGate has endeavored to give researchers a platform where they can not only upload the journals they’ve been published in, but share raw data as well — along with experiments that failed or succeeded — in an effort to make that knowledge accessible in a broader context. This could potentially be a big step forward for the community, because records of what scientists are studying or the data they compile, typically get thrown out, or are lost are discarded. But, through ResearchGate, they now have the ability to upload, store and share that data with existing or potential collaborators. 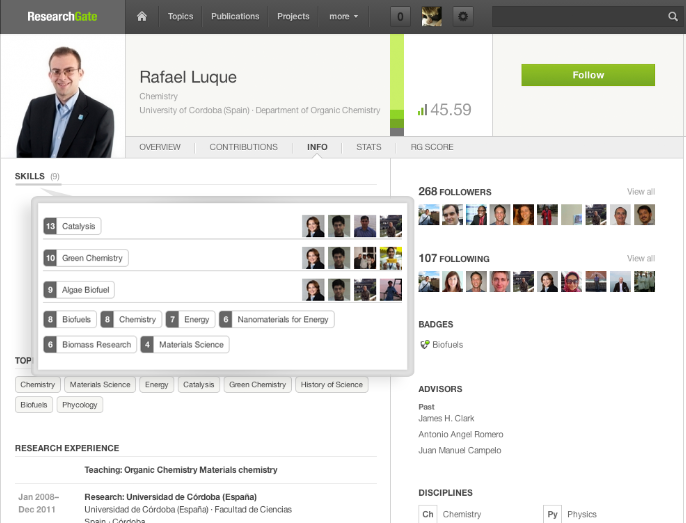 While simply enabling scientists to have a professional profile outside of LinkedIn could be a big step forward for research in this context, allowing them to find an connect with co-authors, discover new publications that could suit their research and view all the citations of their work within their individual networks. Not only that, but Madisch says the team is now looking to take this idea to the next level, to create a new way for scientists to publish their results and data sets. Although the peer-review process is an inherent part of the pre-publishing process, the ResearchGate founder says that he wants to give researchers the ability to do post-publishing peer-reviews as well — something that’s not really a part of the current system, he says. “The process scientists have to go through to give feedback on published work is slow and outdated,” Madisch says. “The future is in transparency, not in having to hand-write letters to the editors … We want to help authors of scientific papers find problems or errors in their research faster and increase the amount of feedback they’re able to get in a shorter amount of time.” This could not only contribute to the amount of prestige or respect one is able to gain in their field, the founder continues, but could lead to authors being more cautious about what they publish. If there’s more information being shared, and readily available, it could help these scientists find duplicative research before publishing. 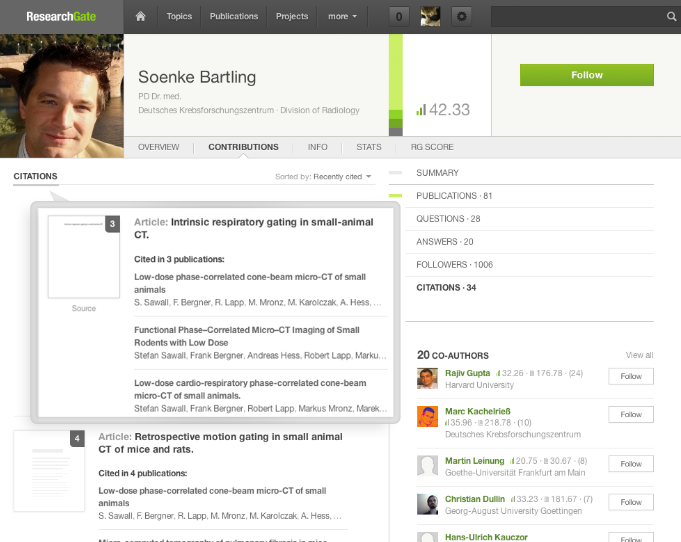 The team has also been busy building out its reputation system (the scientific community’s own version of Klout), in which users get ranked based on the quality of their projects and their activity within the community, for example, as well as an internal Q&A, or Quora-like system, which enables users to quickly ping other members of the community to ask questions, request data and so on. The startup is also building out what the founder says is “already the largest job board for the scientific community,” in which members can find job opportunities, discover grants and institutions looking for specific skills or talent. To begin with, it’s in the community’s growing job board where the founder sees future opportunities for monetization. As of now, companies and institutions can post in the community for free, but Madisch says that down the road, one can imagine ResearchGate beginning to charge employers to post their listings in its job forum. The founder also sees an opportunity for monetization in creating a marketplace for scientific equipment and services within ResearchGate, allowing manufacturers and the companies responsible for making and distributing those services to get direct feedback from the community on what works and what doesn’t. In the near-term, the ResearchGate founder says that company will focus on using its new $35 million to scale and ramp up growth and engagement. The company is also beginning to toy with the idea of creating an API and finding the best ways to open the platform up to enable third-party developers to build apps and tools based on the data being aggregated within its walls. It’s still early in the game, but ResearchGate is beginning to show signs that it could have the opportunity not only to influence the trillions spent each year on scientific study, but how scientists share data and knowledge, connect with each other — and publish their findings. The more ResearchGate is able to speed up the process and reduce friction, the more the network can help close the loop between research and real-world results — and impact.